Dozens of local residents this week voiced their opposition against the proposed infill development on Hansen Boulevard behind the Orangeville Mall, which town staff estimates would house about 1,500 people. The proposal, fronted by Orangeville Highlands Limited and Brucedale Investments has been in pipeline since 2010, when the coalition submitted a zoning amendment request and draft plan seeking official approval for a then 545-unit high-density subdivision. Brandon Ward, Orangeville’s Manager of Planning & Infrastructure Services, informed the Citizen that a new application submitted in May raised the total number of units to 623. During a public Council meeting Monday at Tony Rose arena to discuss the potential development, Mr. Ward noted construction, if it were to go ahead, would take place on 11.83 hectares of open land along Hansen Boulevard. 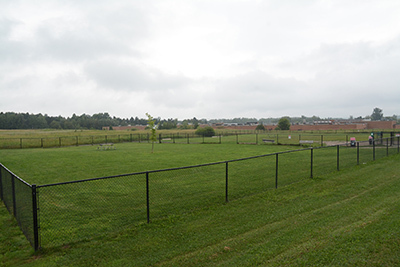 Tentative plans, he revealed, call for two “open space parks” on the site – with one of those currently designated to house the community’s off-leash dog park. Karen Bennett, a planner representing the two applicant firms, was on hand to present more information to Council. She noted the developers have owned the land since the 1980s, and were, in fact, developers of the Orangeville Mall in the 1970s. Since then, they have been involved in developing lands along Brucedale Boulevard, Hansen Boulevard and Amelia Street. “We have a proven track record and an interest in the betterment of Orangeville,” Ms. Bennett said. When the Hansen High Density Awareness Group (HHDA), fronted by Dorothy Pedersen, came forward in June, one of its chief concerns centred around the sheer density of its development, and the pressures it would put on existing municipal infrastructure, notably sewers and roads. But Ms. Bennett said this land has always been earmarked for what she described as “busy development”. It will also help Dufferin meet growth targets set by the provincial government, who have challenged the County to boost its population to 80,000 by 2031 from the 2016 Census figure of 61,735. Delving into the specifics of the plan, Ms. Bennett noted there would be approximately 191 townhouse units and 432 apartment units going in at the site. Proposals call for two new intersections on Hansen Boulevard. When asked to reveal details on the total value of construction, estimates for number of jobs the project would create and projections regarding development charges, Ms. Bennett said she was not in a position to provide those at this point. She also refused provide any information regarding potential pricing of the units. A rendering of a six-storey apartment complex was included in a package submitted to council, with Mayor Jeremy Williams remarking that it looked like something “out of Chicago, or New York City” and asking Ms. Bennett if the developer would consider designing something more befitting of Orangeville. In the public portion of the meeting, several residents stepped forward to voice their concerns. David Page noted that with an additional 1,500 people projected to live there, he “can see the traffic issues already”, while Council candidate Vic Thapar asked how the municipality’s sewer system would hold up in the face of such an extensive addition. Answering Mr. Thapar’s question, Doug Jones, the Town’s General Manager of Infrastructure Services, noted the ongoing multi-million-dollar expansion to the sewage treatment plant accounted for all potential future development in town. Karen Morrison brought up the environmental impacts this development will have on numerous species, stating any construction would disrupt the eastern meadow lark, various butternut trees and an assortment of between 300 and 400 birds. She also expressed concern over the potential loss of a wetland area she described as being an “important recharge station” for the Orangeville Moraine aquifer – one of the community’s primary sources of water. Nunzio Carnovale, who retired to Orangeville with his wife from Mississauga just a couple of years ago, pleaded with Council to give this issue the attention it deserves, saying he wouldn’t like to see massive density in Orangeville. “Looking at this planned development with the townhouses and the apartments, human beings are being treated like sardines. It’s wrong,” Mr. Carnovale said. Finally, Ms. Pedersen took to the floor to rapturous applause to offer her thoughts once again on this project. In a letter submitted to Council, she highlights numerous other issues with the development and asks that the Town acknowledge the lack of suitability of this site for high-density development. “The applicant’s request to change the zoning bylaw for the said lands is inconsistent with the Town of Orangeville’s official plan, and as such, we request that Council deny the applicant’s requests,” Ms. Pedersen wrote. Council voted simply to receive all the information as presented. The application is currently under appeal to the Local Planning Appeal Tribunal (LPAT), formerly known as the Ontario Municipal Board. A hearing is scheduled for Feb. 26, 2019.